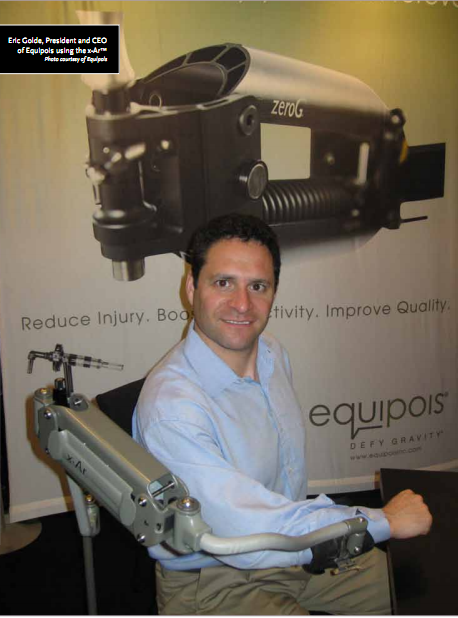 Eric Golden, President and CEO of Equipois® Inc.
Eric Golden, is President and CEO of Equipois® Inc., a company specializing in creating products that increase worker productivity by reducing fatigue on the body. In March 2011, the company released the x-Ar™, an exoskeletal arm that attaches to the arm of the user giving them the ability to hold and maneuver objects as though they are weightless. Tell me the story of the x-Ar™. EG: The x-Ar™ is an exoskeletal arm support. It attaches to your arm and supports your arm’s weight so you can work with it outstretched without bearing the weight of your arm. It’s a decedent of our zeroG® technology, which has been around for a number of years. zeroG® technology holds tools and parts and let’s workers move them as if they were weightless. The zeroG® technology has been used by many major manufacturers in aerospace, automotive, machinery, assembly and metalworking. EG: It’s actually a decedent of the Steadicam™, which allows a camera operator wearing a vest to hold the camera so the camera seems to float. We worked with Steadicam™ inventor Garrett Brown to adapt that technology and evolve it for use in the workplace. How is the x-Ar™ different from the zeroG®? EG: The x-Ar™ attaches to the arm itself so you continue to use your hands normally. The exoskeleton is just helping you out, making you have more strength and stamina than you would alone. [It’s helpful] if you’re working with with very small tools or just for activities that require you to work with your arms outstretched. It could be used for something as simple as operating a computer keypad, if you have to do it in a position where your arms are outstretched. Or it could be used with drills, finishing equipment, welding, soldering—any activity where you can picture somebody needing to have their arms outstretched all day long. How is the exoskeletal arm support powered? EG: The x-Ar™ is mechanical. Usually it’s attached to a chair or bench. There are no motors, no hydraulics, no pneumatics. It’s really just a very clever spring architecture. We precisely control the termination point and angle of the spring as the arm moves so that it applies constant force no matter where it is. That new trick, which uses a centuries’ old technology, produces an amazing result—a feeling of weightlessness. [Your arm] still has mass, but it just feels weightless. I have a picture of me holding up a 28-pound tool with one finger. I shot a video of my eight-year-old son moving a 16-pound grinder through the air like it was nothing. Will there be a version of the x-Ar™ that attaches to a person’s body with a harness, making them mobile? EG: There is a fair amount of demand for a harness version. I would anticipate one later this year. The whole thing, even with the mounting, is only 12 pounds. The parts that move are only five. We made them as light as possible so that you wouldn’t feel like you’re lugging around a lot of metal. What is the cost, and will there be a consumer version in the future? EG: The cost is not finalized, but we expect it’s going to be in the $2,000 to $3,000 range. There will be a consumer version; the first will be for folks who have physical challenges. Ultimately, we envision people with brain injuries and serious disabilities being helped by this, but that’s a little bit down the road. Right now our pilots are focused on high-risk activities among able-bodied people in the workforce; but it would also be great for rehab or to help people get back to work sooner. Is the purpose of the x-Ar™ to enable a human to work with the precision of a robot? EG: That’s exactly right. One of our core beliefs is that the most talented universal tool out there is the human hand guided by the human mind. Automation is great for highly repetitive tasks, but if you need real perception and judgment and fine motor control, you just can’t beat a human being. Our mission is to empower people and not to replace them. We give people the stamina and strength of a robot, but the fingers and the brain of a human.